Request a quote today for a free evaluation and estimate of your gutter needs. 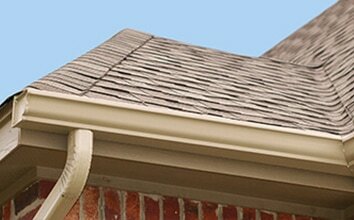 Long-lasting metal K-Style gutters are a popular choice for many homes. Rain Storm K-Style gutters are crafted from the highest quality materials. You can count on us to provide and install the seamless gutter products you can rely on for many years all of which are backed by a competitive warranty. 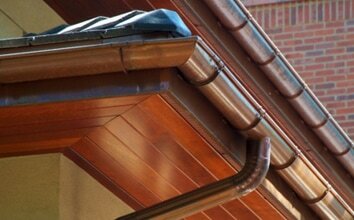 Make a statement with the timeless, traditional style of Half-Round gutter. Choose from painted aluminum, painted or galvanized steel, or the striking look of pure copper. Whether it’s new construction, restoration or repair, Rain Storm Half-Round gutters deliver the look you want and the performance you need to protect your home from damaging roof water runoff. We can install gutters in many different colors, and can often find something that will match or compliment your paint and trim colors. Clean gutters protect your roof and foundation. Rain Storm gutter protection, including gutter guards, shields and downspout covers, helps keep tree debris and leaves from clogging your gutters. Rain Storm has a solution for every gutter and downspout type. ​Gutterglove gutter guards perform to your expectations year round. They keep out leaves, pine needles and roof sand grit 365 days a year. Comes with a 25 year no clog guarantee. Rain Storm is an exclusive Ninja® Gutter Guard installer - the only one in Minnesota. Whether your gutters have been damaged by natural elements or you simply want a new gutter installation that can help keep them clean, our professionals are here to help. We'll work to get your gutters up and running as soon as possible. If your gutters are clogged with leaves, ice, or debris, it could lead to water backup and eventual cause damage to your home. Let us perform a gutter cleaning and get your gutters back in order. Our rates are affordable and highly competitive without sacrificing quality. We treat all our customers with respect and professionalism. Call 320-292-4026​ or fill out this form for a free quote.